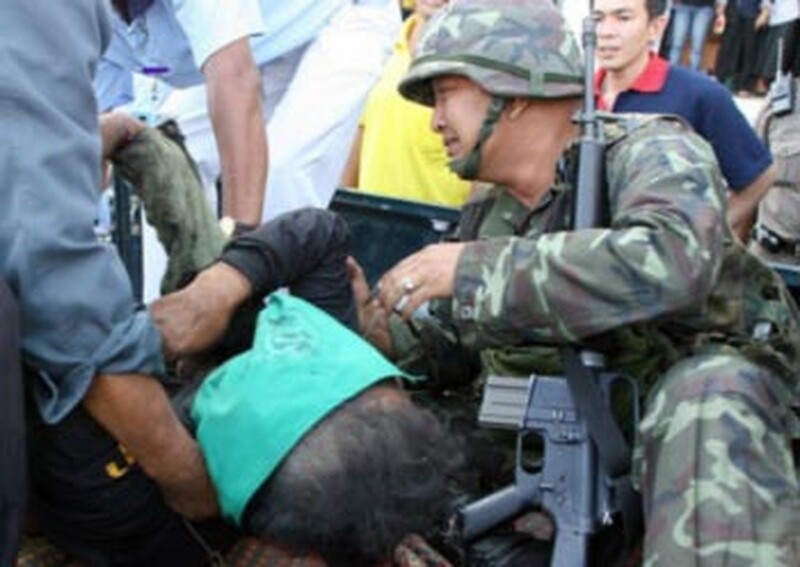 YALA, Thailand, Dec 6, 2006 (AFP) - Suspected separatist militants have killed 11 people, including two policemen, in Thailand's Muslim-majority south, police said Wednesday, in a bloody two days across the troubled region. In the latest attack, a Buddhist man was shot dead at a gas station in Yala province on Wednesday afternoon. Police said militants stole his pick-up truck. Earlier on Wednesday, two men were shot dead in a drive-by shooting in Yala, while a soldier assigned to protect local schoolteachers was killed when a roadside bomb exploded. Two other soldiers were injured. A soldier killed by a bomb explosion outside a car showroom in Yala province southern Thailand, 06 December 2006. Two border policemen were killed in an ambush by militants in Pattani, another of three provinces bordering Malaysia beset by separatist violence and other unrest that has killed more than 1,600 people since January 2004. In Narathiwat province, a 48-year-old Muslim was shot dead at his grocery shop by two militants who posed as clients, police said. On Tuesday, two Muslims, including a 13-year-old boy, were shot several times in Narathiwat and died at the scene. Police also confirmed that two people were killed by a bomb that exploded Tuesday morning outside a car showroom in Yala. Violence has intensified in the three southern provinces of Yala, Pattani and Narathiwat in the past month, despite moves by Thailand's post-coup government to forge peace in the region.